If you’ve ever planned events, you know how frustrating it can be if they don’t turn out the way you thought. Fortunately for me, I’ve planned smaller meetup-type social events that aren’t the fundraising kind. Even if only a few people show up and have a few drinks and a few laughs, you and your guests can consider it a successful evening. You would think that social media marketing would give event planners a huge leg up to get tickets sold and butts in seats. It’s summertime right now – a busy time for events – and my friends and I are checking out festivals and meetups on a regular basis. But I’ve seen so many huge, basic event marketing mistakes that make me wonder if anyone is forking over their dollars to pay an admission fee. 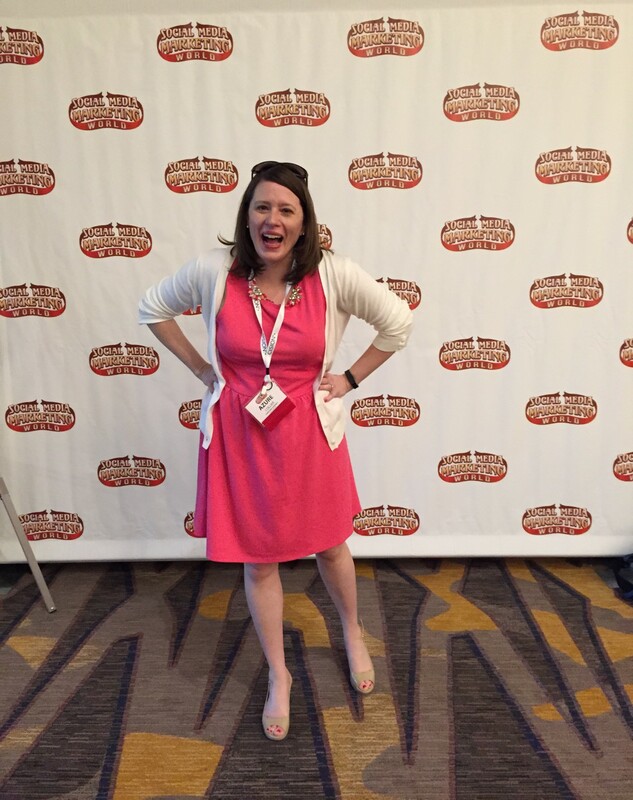 Here are 3 event marketing don’ts. Names and identifying features are blacked out to protect the guilty. Hey, I’m annoyed, but I’m not a jerk. Don’t forget vital information – like the time. And LISTEN to your Facebook fans. I recently paid $112 for 2 tickets to a brand-new music festival. Happy to do so – my husband and I love one of the bands that’s playing, the festival is 5 miles from our house, and neither of us had plans for the day. The problem? We’ve heard about the festival for a month, and – even after buying the tickets – could not find the time that it starts and ends. Anywhere. 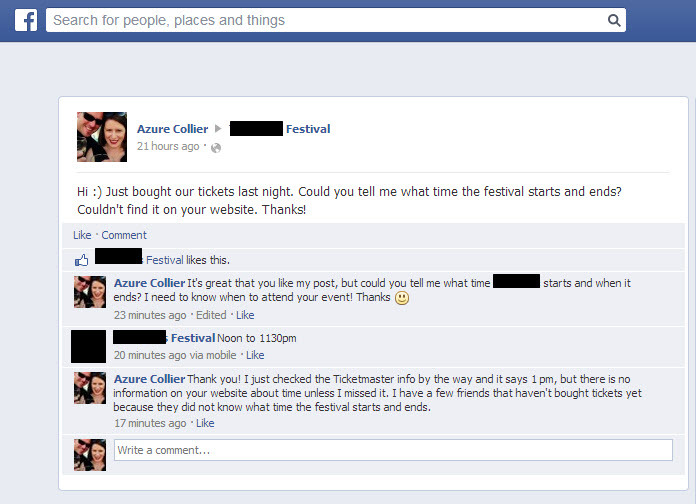 Not on the festival’s official web page, not on their Facebook page, and not on the Ticketmaster site. Despite that, we bought tickets anyway (again – we do not have plans that day and we are really excited to see one of our favorite bands), but none of our friends purchased tickets because they wanted to know the start and end time before committing. I asked organizers about the time, and – instead of answering me – they liked my comment. What?! Did they even read my comment? I just paid $112 for tickets. Tell me when I need to show up. Why is it so hard to find this out? By the way, their answer was wrong. They officially released the schedule on their website since that post, and the entertainment begins an hour later. If you are having an event, please make sure the time and date are EVERYWHERE. And make sure the information is CONSISTENT. I’ve never had this experience anywhere else, and it is ridiculous. Attending an event should not involve attendees begging organizers to tell them where to show up. Don’t put the burden on your attendees. And be professional. I love 5K races. There’s a few local 5Ks that I’ve participated in since moving to New England. I know – 5Ks are mostly an all-volunteer effort, and sometimes that means you’re not going to get top-notch, professional marketing. But you should make an effort because it could make a difference. They sent a reminder through the registration service – my Gmail flagged it as possible Spam. And the organizer tells his potential attendees in a poorly-written email to register ASAP so he doesn’t have to deal with last-minute registrations like he did last year. Last-minute registrations are NOT my problem as an attendee for a 5K race. There are a lot of people who do wait until the last minute because of weather. Your communications to attendees should be professional (check your spelling and grammar! ), provide the facts, and thank people for even considering your event. That’s it. Here’s a reality: A large portion of your audience is finding your event information via mobile. And that’s because a smartphone is an important part of our daily life – 79% of adults age 18-44 have their smartphone with them 22 hours a day. We’re using mobile when we’re meeting up with and talking to our events and making plans. We’re using mobile while we’re watching TV at night. We’re on our smartphones when we’re waiting in line. We are using our smartphones as a way to plan how to spend our money and our free time. Can you read this calendar? I can’t. Unless I squint and scroll, and use an un-pinching motion to zoom in. And I’m probably going to click the wrong link because sometimes links are too close together. No matter how much I zoom, I can’t aim that well with my giant finger. Your website and your event information need to be easy for me to find, read, and scroll on a mobile phone. If it’s not, I’m going to give up and check my email. Or check out my Facebook and Instagram apps. Make sure your font is not tiny. Don’t overload your page with lots of paragraphs and photos. I don’t want to spend 5 minutes scrolling. Give me the basics on one page. 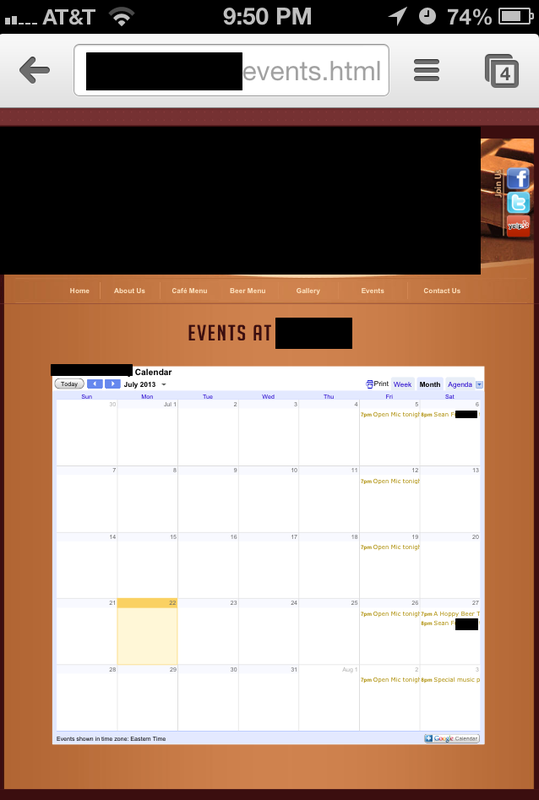 Not sure if your event info is mobile friendly? Try it out on your phone, or ask a friend or colleague to check it out. Can they find what they need right away? I’ve covered the don’ts today, but what should you be doing? Check out my posts on marketing best practices. Or add your suggestions in the comments. If you’ve found examples of event marketing gone wrong or event marketing done right, I’d love to hear about it!